I happened to wait until the last day to visit the David Hockney exhibit at the DeYoung Museum. This is a good set up for museum apocalypse; hey, why not bring my six- and two-year olds along as well? (Grannie too, mustn’t be outnumbered). Earlier in the day we had set aside the low hum of dread brought on by this rainless, temperate winter that has unmoored our internal sense of seasonal ceremony (like I imagine the first feeling of zero gravity) and enjoyed an outing to our favorite beach. It was an apt choice as a warm up to Hockney; big colors, breezes, clouds blown askew, a constant sense of motion. I’ve seen plenty of paintings. I’ve painted plenty of paintings (wouldn’t mind time to paint more…). Most of this viewing and doing I have done alone. So why not try something different and ask someone else who loves painting for a thread to follow before visiting another show? If you aren’t familiar with Daniel Coffeen, I would be honored to think this page served as your introduction – what a cool dude. 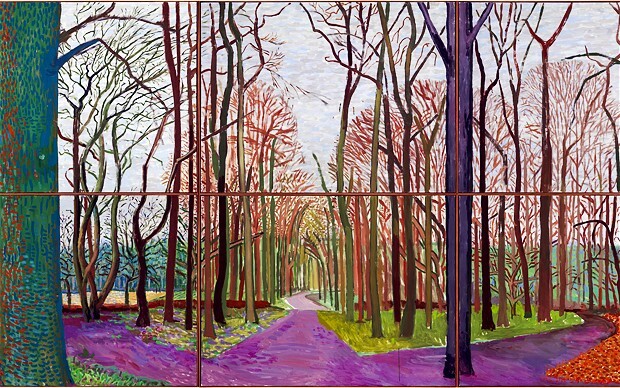 For a much better exploration of Hockney, and painting, please read his post on Art as Argument. So usually I labor somewhat over what I write; I’d say I edge toward the more perfectionist side of the spectrum when it comes to considering something as “finished” (Thiebaud’s better term is “complete”). Rather than fuss and fret over thoughts perfectly scripted, why not share the notes I quickly took on my iPhone whilst viewing the exhibit (amidst the churning masses, in the middle of some confusingly small gallery spaces (given Hockney’s generous scale (can I do multiple parentheticals like this? )), with the two-year old now safely asleep in her stroller)? Hockey’s fragments are the landscapes of schools. Imperfect pairings, still giving shape to something whole, and complex. There is no one perspective. Video montage of 9 images – 9 ppl (or squirrels) walking in the woods…see diff things. No fussing over brush strokes. Sometimes the sky is unpainted. Canvas sections – practical for carrying. 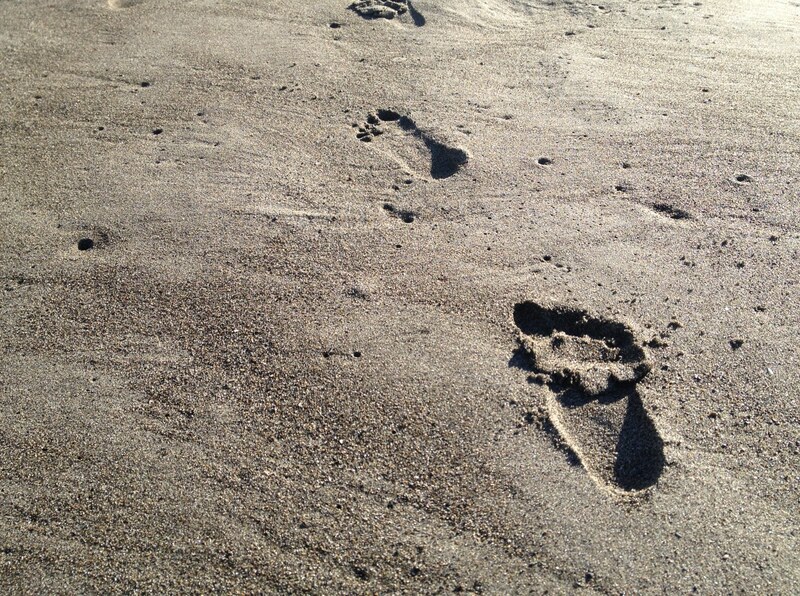 Also a landscape/image shifts when you move a foot in any direction. Trees don’t line up btn canvases at times – doesn’t matter. I know it’s a tree. Landscapes include the telephone poles. If there is one thing I adore about Hockney it is the relaxed nature of his methodology – he isn’t belaboring every line into crisp submission (think O’Keefe – whom I love…and who, coincidentally, is the next big show at the DeYoung); white canvas or paper is often the sky. He knows that we know what he’s aiming to represent; when so inclined, can put forward a perfectly gorgeous sky. But his technique is not the point; his work is representational, yet also conceptual in the thoughtscape it elicits. You are looking at the recognizable world, often broken into sections; rather than an uninterrupted surface upon which the painter performs his alchemy, Hockney gladly breaks down his monolithic images into quaint sections – often framing each section separately. Each one stands alone, yet it also fits into a larger context (refreshingly, it virtually never fits perfectly – trees often move a 1/2 inch off-center between sections). His work leaves me feeling uncertain as to who/what I am as the viewer – a welcome uncertainty. And his voracious appetite for exploring new media! His iPad paintings of Yosemite! His multi-screen video montages of advancing through woods – one for each season! One portion of the exhibit (to note: one of the most crowded) were process videos of him completing his iPad images. He isn’t interested in mystery – here it is, here is how I did it. Rather than see the master’s work, people want to see the master at work. How he works. Far more interesting. To note. 1 thought on Hockney's video montages at @deyoungmuseum – filmed at eye level, yet move forward more slowly than walking pace. Why so? @MrZiebarth @deyoungmuseum I like all these. Also, a forced meditation on surroundings. We have no choice but to advance slowly, as infants. @DCoffeen we live a myth of seeing wholly; he posits seeing as the stitching of fragments into a fuller context. A deer padding thru a wood. @deyoungmuseum wonderful premise. I saw trees as passageways (to where?) & saw Hockney playing w/minimalism: how few brush strokes 2 employ? @DCoffeen the fragmentary effect of Hockney's multiple planes creating "one" image hints at infinite variation in perception. @dcoffeen or as #Hockney says about photography: "…looking at the world from the POV of a paralyzed Cyclops – for a split second." My instinct now (my usual trope…) would be to analogize Hockney’s methodology to the realities of working in schools. But I think that line is enough. I don’t need the trees to all line up perfectly. We know they are trees, whether we are a squirrel or a person or neither (it is just oil on canvas, after all…). I think I’ve said enough. Posted in Art and Creativity, UncategorizedTagged Art, Creativity, Daniel Coffeen, David Hockney, Fragmentation, Sean ZiebarthBookmark the permalink.